he Florida city of North Miami has declared November 17 as the ‘Kashmiri Hindu Heritage Day’, in recognition of the resilience of Kashmiri Hindus who were displaced from their homeland two decades back. The proclamation in this regard was issued by Andre Pierre, Mayor of the City of North Miami – one of the largest cities in South Florida. “We in North Miami, which has such a wonderful diversity, are glad that we are part of this function that showcases Kashmiri Hindu culture,” Pierre said as he handed the proclamation to the city’s Kashmiri Hindu community. 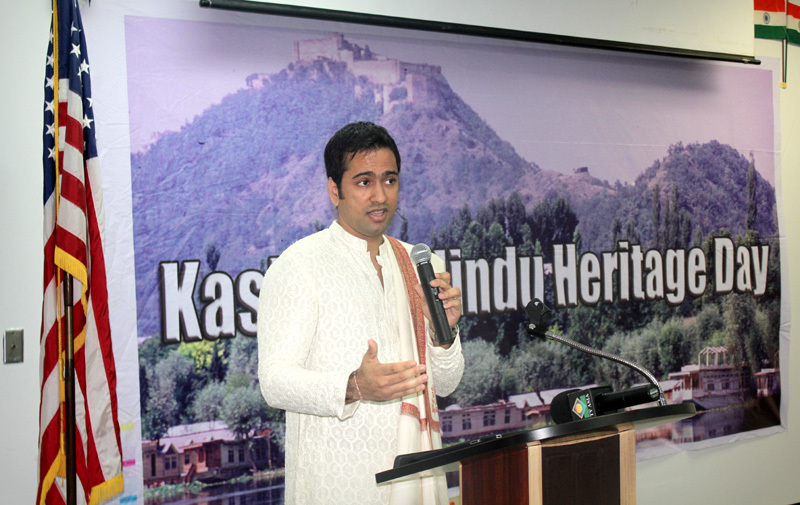 The proclamation noted that 500,000 Kashmiri Hindus were dislodged by acts of terrorism and many of them migrated to the USA and today 22 years later, a majority of them have not returned to their place of birth due to fear but have retained and preserved their 5000 year old art, culture and cuisine. A function in this regard was sponsored and organised by author Chandramukhi Ganju, with the support of Kashmir Hindu Foundation and North Miami Library. Mrs. Ganju is the author of two Kashmiri cuisine books called Koshur Saal and Kashmiri Cuisine. I had the privilege of emceeing the event. Below is a reproduction of the speech I gave. Kashmir, in addition to her enthralling beauty, the majestic mountains embracing within their grasp the endless valleys and the gorgeous lakes, is home to a civilization, a way of life, a culture which goes back thousands of years. While the natural beauty can showcase itself to the world, and it unfailingly does 365 days a year, 24 hours a day, in full splendor, the culture and her heritage needs its ambassadors. That is why we have gathered here today, to celebrate the Kashmiri Hindu heritage, to revel in the intricate details of wedding and religious rituals, the exquisite shapes and designs of her arts and crafts and architecture, the uniqueness in the delicious foods which, believe me, have become the easiest way to both a man and a woman’s heart, the absorbing turns in her history which give us an insight into what shapes that pious land today, and her sages, mystics and philosophers who have left for us the inspiration and wisdom of a lifetime. Little over a couple of decades ago, due to an unfortunate set of events, Kashmiri Hindus couldn’t live peacefully in their own homeland. Countless stories abound of how families after families fled their homes with whatever could fit the shivering embrace of their two hands. Their bodies may have been restrained, their hearts shaken with fear, but which force could ensnare their souls? Wherever destiny took them, they carried with them their heritage. As the saying goes, you can take a Kashmiri Hindu out of Kashmir, but can you really take Kashmir out of her? The culture on display today at the North Miami Library is a testament to that unshakable attachment to their way of life. We Indians are a deeply religious and cultural society. The insistence on performing every aspect of our culture, of our rituals, with elaborateness and precision would be fairly ostensible to you. Why then this insistence, one might ask? Why this painstaking effort to do things the same exact, even if elaborate, way our ancestors told us to do? The answer is simple. Like an engineer who incessantly works to devise and design a machine feels such joy – almost as if he is experiencing the divinity in his labour – the Kashmiri Mother who ensures on adding just the right amount of turmeric in her food experiences the sheer magic when her beloved relishes each bite. The stunning adornments which find their way on a Kashmiri bride are the result of a chaotic yet paradoxically, a peace-generating process which creates a breath-taking visual every time a bride meets her groom at her wedding. And when our little daughters (pointing towards them in the audience) see a Kashmiri bride in her wedding gear, it not only conveys to them the fact that one day they will look as beautiful, it also inculcates in them the feeling that the outcome is as a result of patient disciplined efforts on the part of those who love them immensely. In this way, each and every aspect of our culture, when so dutifully performed, brings us ever so closer to feeling that inexplicable kind of divinity. You have been invited today to join us in experiencing that joy as you walk through the different booths which highlight different aspects of our culture. All that you will momentarily see has been set up by the woman of the moment, Mrs. Chandramukhi Ganju. We would love to know your experiences today. Feedback forms have been kept at the reception; please spare a few minutes to offer your suggestions. Thank you, ladies and gentlemen. *Kartikeya Tanna is an attorney by profession and is a partner at Tanna Associates, a law firm in the State of Gujarat. Kartikeya is actively involved in current affairs around the world and has a special interest in politics. He regularly writes articles on laws, finance, politics and economics for various publications. 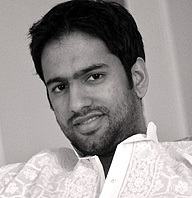 He also maintains his blog at www.kartikeyatanna.com which contains a collection of his writings.